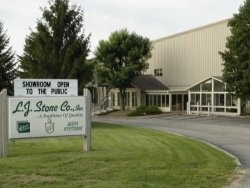 Who is The LJ Stone Company? As one of the 200 largest specialty remodeling companies in the United States* and one of Indiana’s longest standing home improvement contractors, we have proven our ability to save you money while providing the highest quality products and workmanship for your home. Our company is large enough to give you great value for your dollars and high quality products, but as a second generation family run company we are concerned enough to give you the personal attention and great results you are looking for. Contact the LJ Stone Company today for solutions to your home improvement and remodeling needs. Give us a call and one of our representatives will be glad to set up an appointment to meet with you. There are numerous products on display to assist in your decision making. Or sign up for a Free in Home No Obligation Estimate and let us come to you to discuss your project.